The staff and the service in this hostel was one of the best and nicest I have ever seen. Antonio was so helpful when we checked in and really tried to help us were he could. Nice location, clean rooms and bathrooms and a very nice breakfast! For this price definitely one of the best choices! I can really recommend the twelve persons dorm because it was super cozy and a lot of space. Great location and really helpful staff. The Trindade station (which has a train directly to the airport) is less than 10 mins walk, and it's really easy to go to touristic and clubbing places from there. Alao staff members were like giving the extra mile all the time to be helpful. Bathrooms were cleaned regularly. Rooms were also good. Each bed has access to a big storage locker which is great. 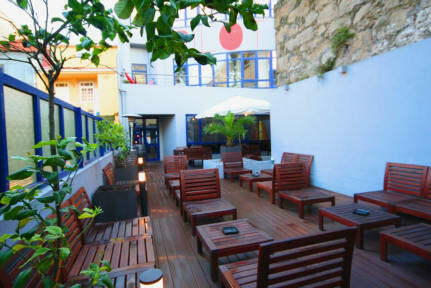 This place is really amazing its definetly one of the best hostels ive ever been. Really friendly and helpful stuff, clean beds and showers, great location, cool design, great kinds of activities like free shots or the Pub Crawl, really cheap and a great place to meet new people. Whenever I go to Porto I will stay in this place. It was super easy to meet people at the bar which was facilitated by the pub crawls and city tours that they organize! Definitely would come back to this hostel!!! Preis ist unschlagbar, die Mitarbeiter sind fantastisch, die Lage ist ideal und die Ausstattung ist hervorragend. Wunderschön eingerichtet und Erwartungen bei weitem übertroffen. Einzige Mängel sind die Sauberkeit auf den Toiletten. Nichtsdestotrotz ein fantastisches Hostel und im Falle einer Rückkehr nach Porto meine erste Wahl. Nice hostel. I would recommend it. Das Zimmer an der Straße war so laut, dass man das Gefühl hatte die Leute stehen am Bett und das Bad war leider auch nicht so sauber.